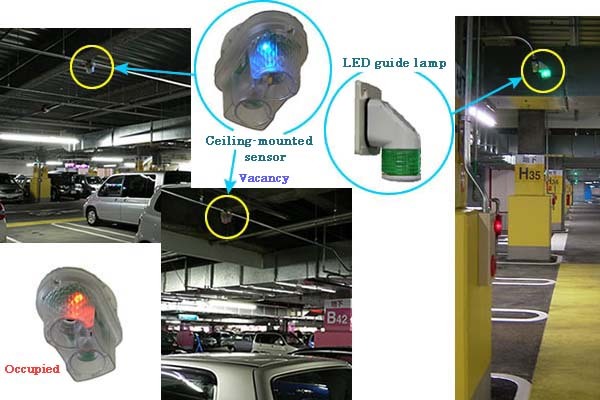 1,845 parking bays on the shopping center’s first floor basement and fourth floor parking lots have been fitted out with EP-III sensors. ・The floor-mounted model offered to date has been joined by the launch of a new ceiling-mounted model. Like the EP-I sensor, no adjustments need to be made at the time of installation. ・As easy to install and expandable as its predecessor, the EP-III can also communicate by means of existing sequencers. Lamps switch off when the all the spaces between pillars are full, and light up “green” if there is at least one free space in order to guide drivers to available parking spaces. The use of LED lamps means that you do not need to worry about bulbs popping.